What else does the future of medicine hold? These major technological advancements could change the face of plastic surgery in the next few decades. 4D technology? Virtual interaction? Prosthetic muscles? You could be forgiven for assuming we’re talking about science fiction. Thankfully, we’re not. All of these fanciful-sounding innovations may soon play a large and positive role in medicine and surgery. This includes plastic surgery, a field which, in an age of rapid technological innovation and transformation, is changing as much as any other. We asked three experts to comment on 5 technologies that could change the face of plastic surgery in the next few decades. Read on to learn more. When it comes to 3D printing, the future is now, as the saying goes. In plastic surgery, 3D printing has mostly been used for modeling; that is, printing out models of structures and features (e.g. the nose), manipulating them on the computer to make them look better, and then printing them out again for comparison against the originals. This is already having an impact on preoperative surgical planning, optimizing outcomes, and other aspects of the surgical process. So far, the technology isn’t really effective for producing the types of implants used in plastic surgery, says Patrick J. Byrne, MD, FACS, MBA, Professor and Director of the Division of Facial Plastic and Reconstructive Surgery at the School of Medicine and member of the Board of Directors at the American Academy of Facial Plastic and Reconstructive Surgery (AAFPRS). But he says that once researchers can crack the code to achieving product stability, things could rapidly progress. 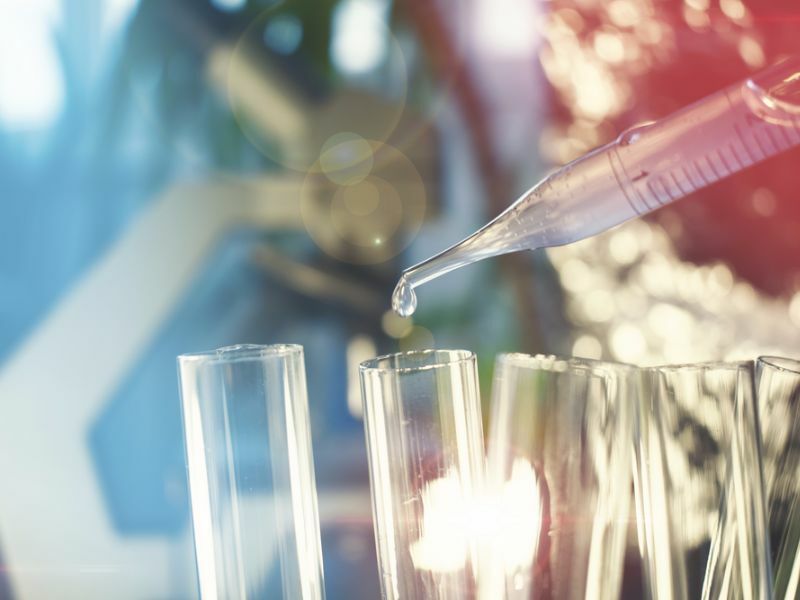 Biologics offer alternatives to synthetic materials. According to the Food and Drug Administration (FDA), a biological product is one that “replicates natural substances such as enzymes, antibodies, or hormones in our bodies.” Also known as biologics, these products represent the leading edge in medical science and research. Biological products can be made of proteins, sugars, nucleic acids, or a combination of these substances. They can also be living entities, such as cells and tissues. Biologics are comprised of an array of natural resources deriving from humans, animals, and microorganisms. In plastic surgery they are used as an alternative to synthetic materials and in some cases may offer even greater benefits, according to Boston plastic surgeon Sam Lin. Benefits can range from lower inflammatory response to protecting against early burn-wound progression. In the future, plastic surgeons may be able to use biologics as adjuncts or replacements for current tools, Lin says. And he says they may in some cases prove to be more accessible and less costly than synthetic products. Biologics are an area of real interest to Byrne, who foresees an era of “generative immunology” in which some of the lessons of adaptive immunology as applied to cancer treatments are applied to regenerative medicine. One example of this that might be applicable in plastic/reconstructive surgery is the use of “donor tissue” (e.g., skin substitutes). 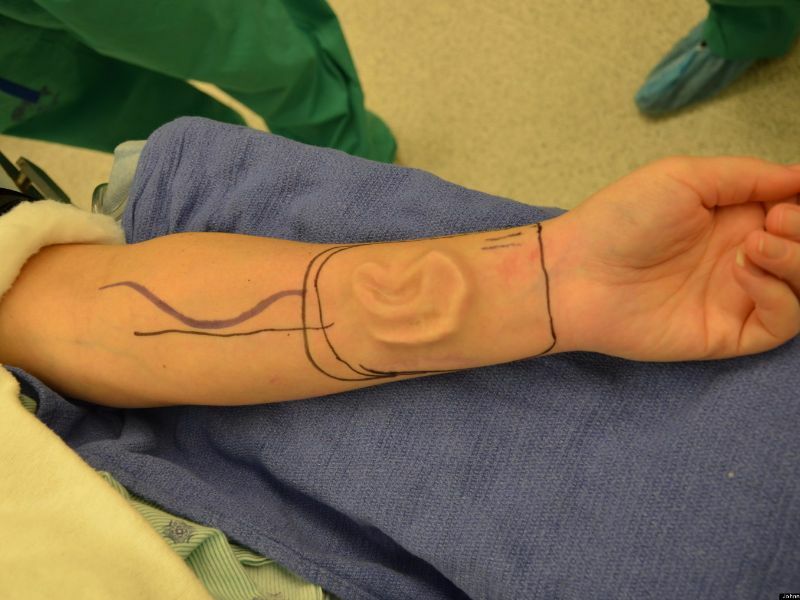 Ear reconstruction utilizing patient’s forearm tissue. From a medical perspective tissue engineering has already been used with some success. And in the future, it could mean that physical structures like ears, windpipes and skin can be grown in the lab and then implanted to restore form and function, according to Byrne. 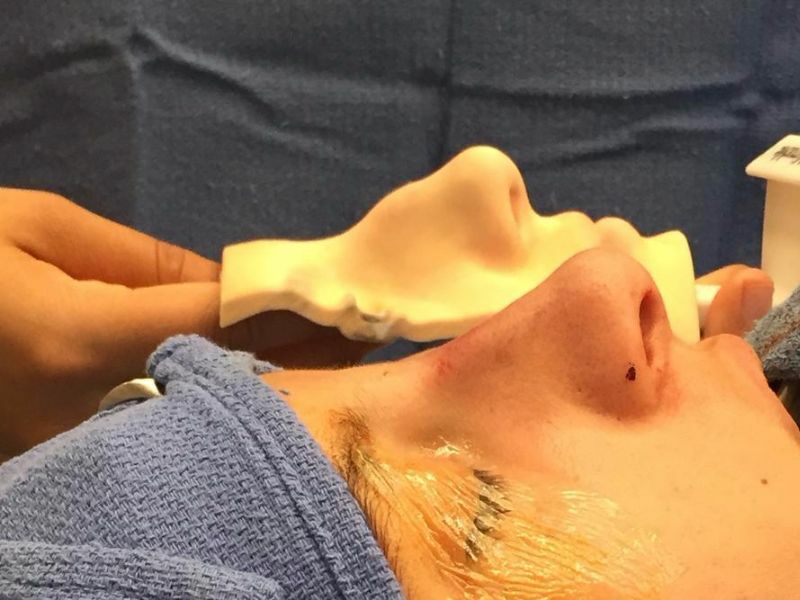 The prospect of advances in tissue engineering is exciting to plastic surgeons because of the specialty’s emphasis on manipulation of tissue, adds Lin. “Plastic surgery is sometimes limited due to confinements of available tissue,” he explains, and this is something tissue engineering might be able to help tackle. According to Lin, advancements in tissue engineering may aid plastic surgeons in providing patients with more options — such as autologous fat grafting and the use of skin flaps — and in optimizing outcomes. However, Byrne points out that, historically, one of the biggest barriers in this area has been cost, which he says comes down to the business model. 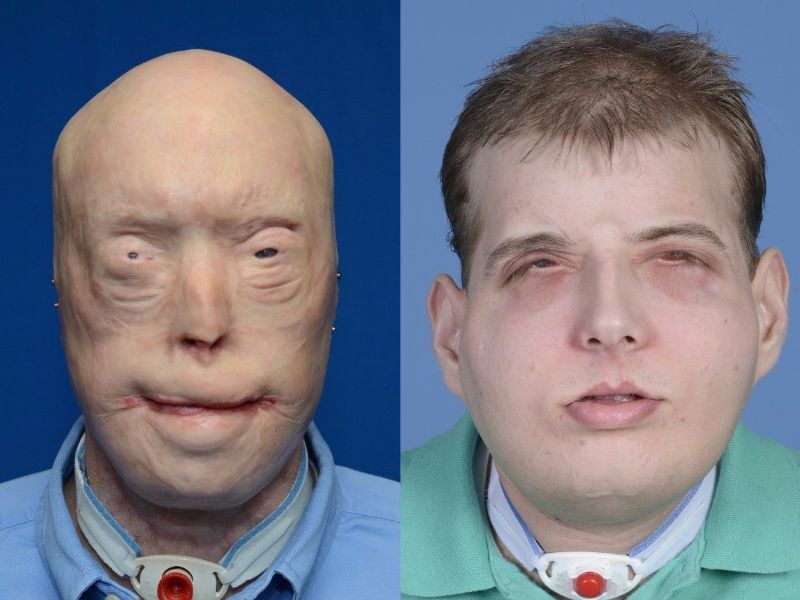 Mississippi firefighter Patrick Hardison before and after full face transplant. In recent years, surgeons have made great strides in the transplantation of complex structures due to better understanding of anatomy, improvement in immunosuppressant therapies and greater knowledge of risk factors and complications on a case-by-case basis, according to Lin. As a result, procedures as complex as full-face transplant have been successfully performed. However, at this stage such procedures are not performed on a mass scale, because many challenges remain. But in the future, this may change. Many experts, such as Byrne, believe that doctors will become more successful at controlling the immune system, which will allow them to perform transplantation of complex structures on a wider spectrum of patients. “This could mean that it makes more and more sense to transplant faces, noses, eyelids, ears, etc.” he says. In 2015 baby boomers accounted for 3.9 million cosmetic procedures in the U.S. 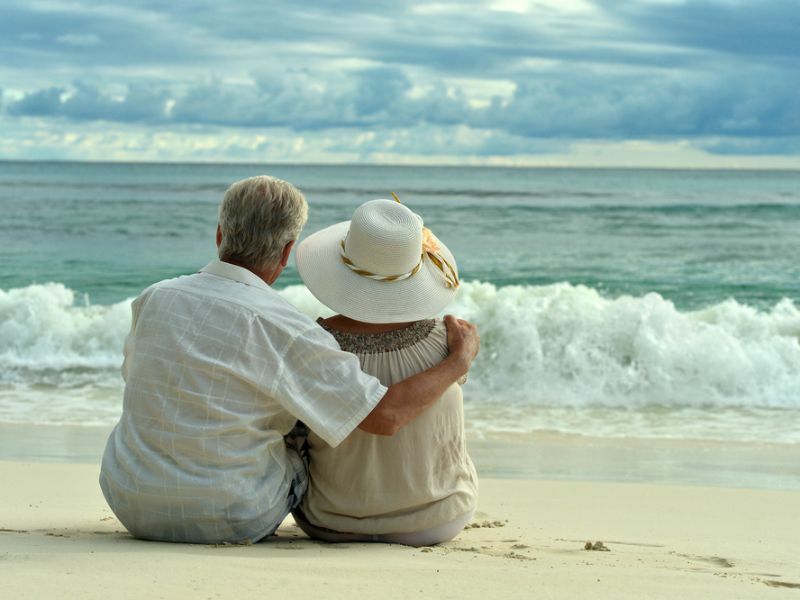 Many medical experts are convinced that coming breakthroughs will substantially slow or even reverse the aging process, including external signs of aging. These breakthroughs will likely lead to pharmaceutical and dietary treatments that will help people to look younger. All of this raises the question: will plastic surgery be necessary? The experts we interviewed responded with a resounding yes. “My personal guess is that demand for plastic surgery will increase if in fact humans live longer, healthier lives,” says Byrne. And Lin points out that patients will always be in need of plastic surgery treatment unrelated to the aging process, such as reconstruction. He also points out that no matter what space-age tools the future may have in store, a skilled operator will always be needed. “Considering that plastic surgeons frequently move skin and tissue around, they are inherently knowledgeable of the aging process and uniquely positioned to best utilize these medical breakthroughs,” he says. Prosthesis arm that connects directly to the bone, nerves and muscles. While we can’t predict with precision what new plastic surgery-related innovations will come to fruition in the coming decades, odds are the abovementioned technologies will be involved. Digitalization of information, through which doctors may be able to precisely record and manipulate patients’ anatomical features manipulated to simulate postoperative results. Lin also cites general technological advancements that could have a big impact; for example, innovative social media platforms, virtual interactive technology and artificial intelligence. And Buford predicts that plastic surgeons will continue to find creative ways to combine various procedures to create synergy, less downtime, and more natural results. Exactly which combinations they will be using that far down the road is anyone’s guess, he says. Cover photo: Tissue-engineered urethra, grown from the patient’s own cells. Photo courtesy Wake Forest Institute for Regenerative Medicine.